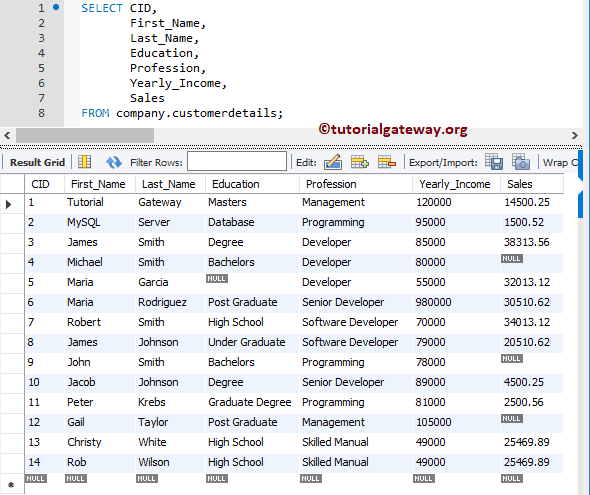 MySQL STDDEV_SAMP is one of the Aggregate Function, which is used to calculate the Sample Standard Deviation of total records (or rows) selected by the SELECT Statement. 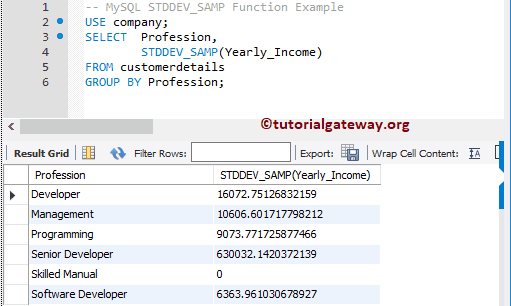 The STDDEV_SAMP function will returns Sample Standard Deviation of total records present in a specified column. For example, below query will calculate the Sample Standard Deviation of total records present in Yearly_Income from Customer details table. In general, we use STDDEV_SAMP function to calculate the Sample Standard Deviation of a products belongs to a particular category or color etc. For this demonstration, we are taking Software Developer profession, and show you the output.